It is an old Greenlandic tradition to make carvings, a tradition that should be cherished and supported. A Snow Festival takes this tradition from the small figurines, that is only seen by a few people, to the big scale in 3x3x3 m cubes. Previously the festival had participants ranging from local families, big international architectural firms and everyone in-between. We hope you will help us make the festival of 2019 a blast! 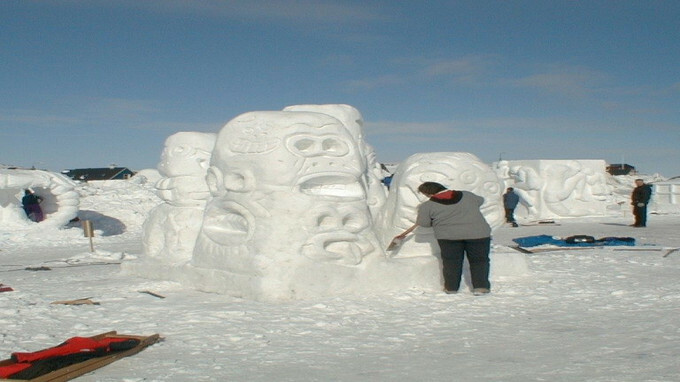 Nuuk Snow Festival was held for the first time in 1994. At that time it was not only the first in Nuuk, but the first in all of Greenland! The festival was initiated by the architectural firm Tegnestuen Nuuk A/S, who also planned the festival for a large part of the 15 years it was held in Nuuk. In a few years Nuuk Snow Festival grew from 21 teams in 1994 to 50 teams at the height of its success. Nuuk Snow Festival gathered people from all kinds of backgrounds: public companies, educational institutions, private firms, families and friends. All gathered in teams to compete in the categories Nonfigurative and Figurative. Even people from all over the world came to Nuuk from countries like the US, Canada, Norway, Sweden, Finland and Denmark. Nuuk Snow Festival brought people together in teams, but also as visitors. The festival site was the ideal place to go, both for family trips and for the romantic first date. It is our goal to once again make Nuuk Snow Festival the place for everyone to have a good time! The 21st of June is the day where Greenlanders celebrate Greenland - and you are invited. Lecture about Northern Lights & the Supernaturalby writer and scienist Ada Grilli.